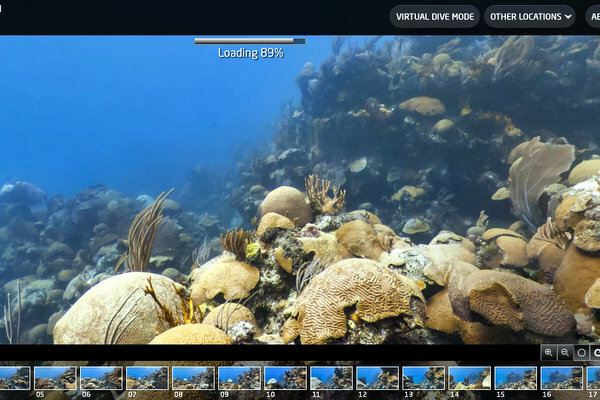 Images taken during the Catlin Seaview Survey of Bermuda have been compiled in an online diving interface that allows anyone with an internet connection to enjoy the island’s offshore gems and jewels, providing an enjoyable and educational experience for all. The official website of the Catlin Seaview Survey will take visitors on a trip through Bermuda’s waters, visiting coral reefs, a wide variety of undersea animals, and even shipwrecks. Catlin Seaview Survey said, “Coral reefs in the Caribbean and Atlantic, like elsewhere, are under growing environmental stress. “Being highly sensitive to environmental change, corals are considered the ‘canary in the coal mine’ when it comes to impacts of climate change and ocean acidification. “Exploitation, pollution, warming waters and increased storms linked with climate change has caused the massive loss of corals across the Caribbean over the past 50 years. “The loss of coral reefs has long-term implications for Caribbean economies given their dependence on reefs and other marine ecosystems for goods, services and economic welfare. “We are committed to understanding the future risks posed by climate change,” said Stephen Catlin, Chief Executive of Catlin Group Limited. To visit the Catlin Seaview Survey virtual Bermuda dive click here.